The roof of Shrine of Christ the King had only recently been insulated when it was burned in an October fire. DOWNTOWN — Supporters of the Shrine of Christ the King pleaded with city officials Thursday to delay demolition permits for the burned down church. 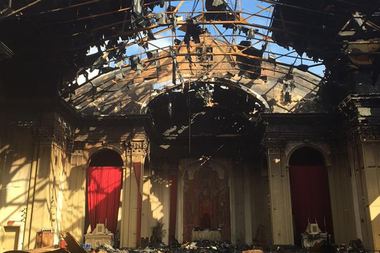 The Archdiocese of Chicago said Tuesday it wanted to tear down the shrine that suffered massive fire damage last October. Demolition permits could be issued as early as next week for the landmark church, according to staff from the city’s Department of Planning. 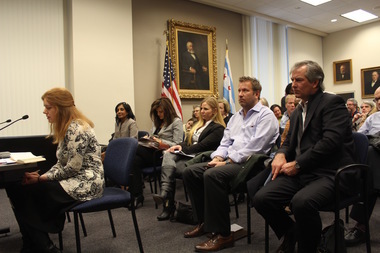 Multiple staff members from various city departments said at Thursday’s meeting of the Commission on Chicago Landmarks they were powerless to deny the demolition permits because the church had been deemed an imminent safety hazard by city inspectors and consultants hired by the archdiocese. Parishioners on Thursday pleaded with the city to intervene and delay the demolition of the Shrine of Christ the King in Woodlawn. Parishioners who had spent more than a decade restoring the church begged for help in delaying the demolition. “Kids have emptied their piggy banks to save the shrine,” said Mary Kubacki, a parishioner at the shrine at 6401 S. Woodlawn Ave. who brought a dozen of the children from the congregation to Thursday’s meeting of the Commission on Chicago Landmarks. The members of the commission repeatedly told commenters that they were bound by city code to approve the permits once the Buildings Department had determined it was an imminent threat, and the decision on if or when to demolish the church was now in the hands of the archdiocese. A spokeswoman for the archdiocese said by email after the meeting that it planned to start demolition as soon as the permits are approved. The demolition permit is expected to be issued next week, according to city staff. She said the archdiocese remains committed to the faith and social service ministries of the shrine. Burritt had said previously that repairing or restoring the church was “cost-prohibitive,” but repeatedly declined to provide figures for how much it might cost. Ward Miller, executive director of Preservation Chicago, said Thursday he has spoken to several developers who have shown interest in restoring the church as either a religious building or other use. None of the developers was immediately available to comment. Burritt declined to answer questions about whether any developers or potential buyers had expressed interest in the church.